Could an unfinished Mary, Queen of Scots portrait be hidden behind 1589 painting? An unfinished portrait of Mary, Queen of Scots, is believed to have been found hidden beneath a 16th-century painting during a major research project. 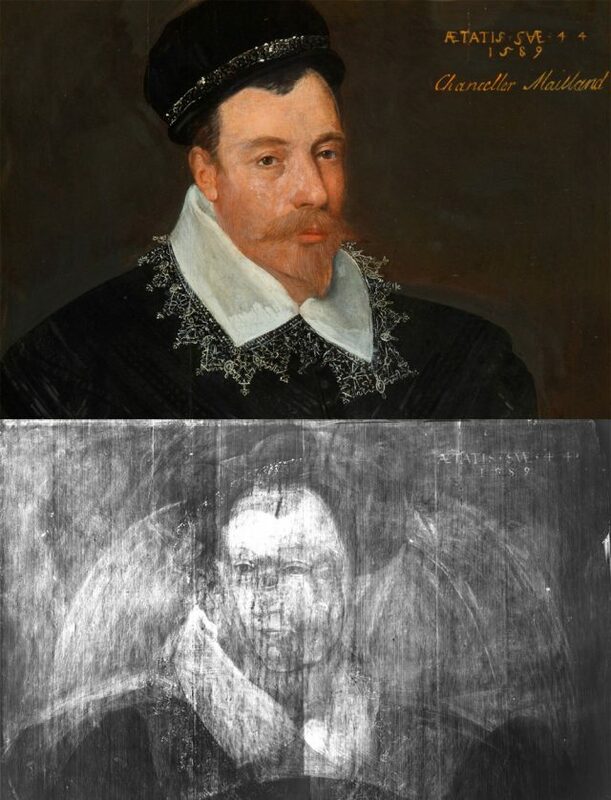 The image of a woman, which experts say has “compelling similarities” to other depictions of the queen, was discovered by an X-ray of a portrait of Sir John Maitland, the Lord Chancellor of Scotland between 1586 and 1595. The 1589 painting by Dutch portrait artist Adrian Vanson was among a number of works to be examined by conservator Dr Caroline Rae as part of research by the National Galleries of Scotland (NGS) and the Courtauld Institute of Art in London. Dr Rae was examining the techniques used by Vanson and Adam de Colone when an x-ray that can penetrate paint layers picked up a lead sketch of a woman underneath the Maitland painting. She was able to trace the outline, forming a similar picture to depictions of the controversial queen made during her lifetime. Researchers suggest Mary’s execution in 1587, two years before the inscribed date on the Maitland painting, may be the reason the portrait was covered over or abandoned by the artist. Dr Rae said: “Using technical art history, it is possible to illuminate artists’ materials and techniques for the first time in centuries, to discern copies and forgeries and to explore questions of authorship and workshop practice. Despite the fascination with which Mary, Queen of Scots was regarded both during her own lifetime and after, experts say there are relatively few authentic portraits of her from her life in Scotland. The Maitland painting – part of a National Trust collection in Ham House, near London – will go on display as part of an exhibition of Vanson and de Colone’s work at the Scottish National Portrait Gallery this weekend. David Taylor, curator of pictures and sculpture at the National Trust, said: “Vanson’s portrait of Sir John Maitland is an important picture in the National Trust collection, and the remarkable discovery of the unfinished portrait of Mary, Queen of Scots adds an exciting hidden dimension to it.